One of the many benefits of membership to http://www.sportscollectors.net/ isn’t just in the abundance of information of hobby information. One of the perks of SCN for me is getting to find like-minded collectors. The past week, I discovered Dave O’Brien posting a question on the SCN member forum. “Letter Ever Make A Difference to An Athlete?” was his question. A dozen responses and more than 600 readers later, his question still rings true for me. A personalized signature is one clue. The signer had to check your name on the envelope or letter. However, a note that refers to your comments, even thanks for you sending them? A sign that a current or former player cares what a fan thinks? Amazing! That’s the priceless value of baseball correspondence. Q: Tell us about your start collecting autographs? What’s your current specialties? A: I have been collecting autographed baseball cards since the age of 14. I started in person going to Omaha Royals games at Rosenblatt Stadium around 1994, and would wait for an hour after the game where the players walked out to get cards signed. Around this same time, I heard of this address book from R.J. “Jack” Smalling that would allow me to write to players at home, and boy oh boy, was I hooked! I’d also drive down to Kansas City and stay after for Royals games 2-3 times a year waiting for autographs. I would say back then, it was 80% mail, 20% in person, just because I lived in neither Omaha or Kansas City, and the Royals were pretty much (and still are) my only interest. I definitely specialize in Royals, especially minor leaguers, which we will talk about later. Nowadays, I’d say I’m still at about 80% versus 20%, mail to in person. I’m 30 years old and feel a bit odd waiting for autographs very often. I will do it 2-3 times a year here in KC and 2-3 times in Omaha and Northwest Arkansas, and Spring Training. Since I only collect Royals, I can get AA, AAA and MLB covered IP simply from those amounts of visits. I like to have 3-5 autographs of each player, but don’t need more than that. I also don’t sell them, outside of the time I purchased my first house and needed a little extra for a down payment. Q: Some collectors might ask, “Why do minor leaguers matter?” I think they have even greater tales, such as Cliff Pastornicky, the fine 3rd baseman trapped in AAA behind George Brett. Your thoughts? A: I’m proud of you for mentioning Cliff Pastornicky. 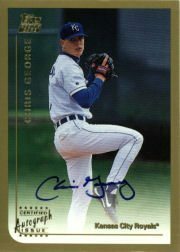 His son, Tyler, is in the 2011 Topps Pro Debut set. Cliff was a scout for the Royals and did you know, he was responsible for finding and signing Billy Butler and Zack Greinke? He was also a VERY difficult autograph for me to get for awhile, then all of a sudden he became easy. Nice guy. But anyway, why do minor leaguers matter? They don’t, outside of the Royals. But I follow the entire Royals organization, and the way its built, is we have to grow our own players. So the hope is, approximately 15-20% of these guys might make the Big Leagues someday, and I like to have ALL of their minor league team set cards signed. I really don’t collect sets like Pro Debut or Just or such – rather, I like the team set cards. They don’t have gloss, don’t require prep, are all the same (the whole teams cards), and look AWESOME together in an album. Most of these guys will never make it and will disappear out of memory 2-4 years after they’re gone, but I imagine myself someday sitting in my sports room when I’m 75 and looking at all of these old minor leaguers and just being in awe. “Yes, I remember him, wow.” And maybe even googling them and seeing whatever happened to them. For an organization to be a winner, it requires EVERY player and affiliate in the organization to work hard, play together and “buy in.” I believe every minor leaguer should be treated equally and are all important. I enjoy getting those cards signed WAY MORE than the Big League cards. A: Form letters are tacky and the players can see right through them, especially the guys I’m writing to, who mainly get 1-100 letters a year, tops. I’d say 90% of players I send to in the minor leagues – I’m the only guy who writes to them all year. They get asked plenty of times IP, but not through the mail. I can’t tell you how many letters I’ve gotten in return from minor leaguers who appreciate my time and attention. I try to mention stats, where they went to college, grew up, welcome them, etc. I want them to know they are a huge part of the organization I love so much. Q: Can you recall Royals who’ve shown they appreciated your personalized letter? A: Man, I can’t even begin to name all the guys I’ve gotten great letters from. A TON. All Royals, pretty much. As I mentioned above, writing a passionate, detailed and “true” letter stands out, and they appreciate it. Chris George, Kris Wilson, Brad Voyles, Gary Martz, Mike Loggins, Danny Garcia, Crawford Simmons, Ed Lucas, Brian Johnson, etc, etc. I could go on for 20 minutes. Thanks for having me and I hope all collectors will start trying a bit harder to write passionate and detailed letters. It is healthy not only for our hobby, but will make checking the mailbox everyday WAY more fun. Coming Wednesday: Pitcher Dooley Womack describes his alter ego.